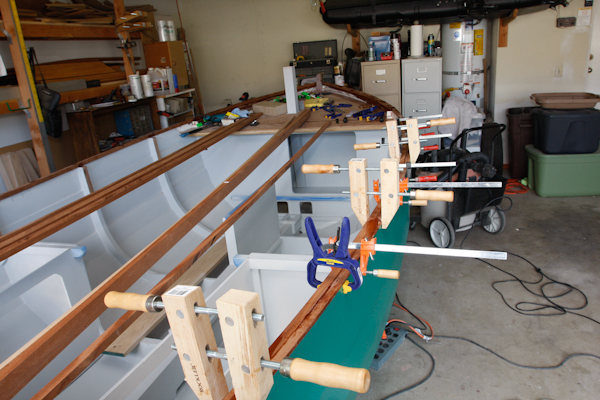 The gunwale on the Ebihen 15 is built up from 5 separate pieces of wood. 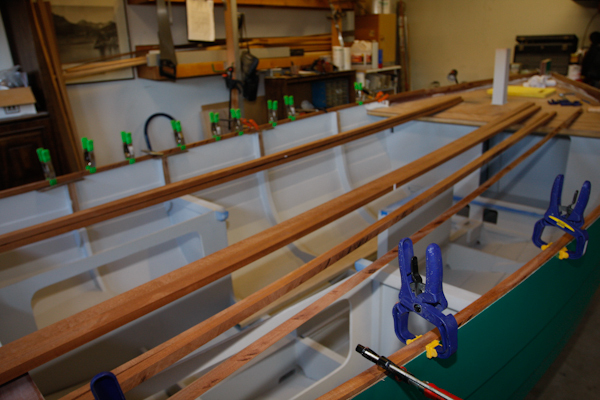 I selected Sapele Mahogany and Oak for the gunwale. 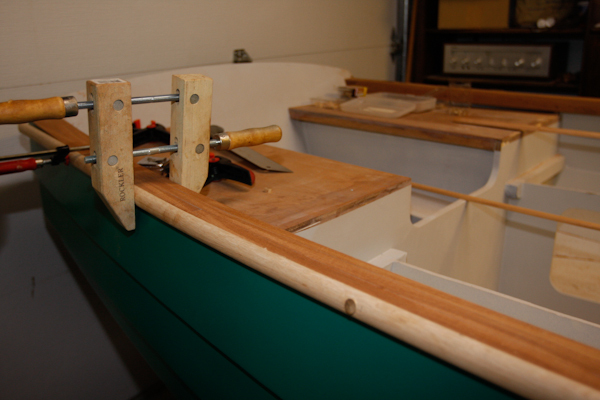 I did not use full length pieces and simply joined together each piece on the boat without scarfing as I built up the gunwale. If you are painting, this is a pretty easy way and joints will not show with good filler and smooth sanding. I am planning still to leave my gunwale bright (no paint), so I did the best fitting I could with each of the joints and so far I am pleased with how the gunwale is looking. Close inspection will show the epoxy joints and a purist will probably be disappointed, but I am more pleased then expected and the construction is still up to my hoped for standards. First layer for the starboard bow. 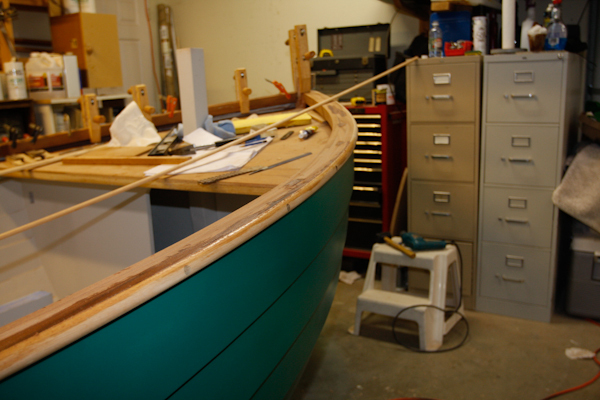 I am restoring a catspaw dinghy with a fiber glass hull. This is the first time I have done anything like this. I need all the help I can get. You will have a great time doing the restore. Enjoy the process, learn as you go, research each step, and don’t rush. I have a 13’catspaw dinghy that I am restoring w/a fiberglass hull. The gunwale was teak or mohogany. It was rotted so Iam having to re-build it. The design had small 3″ or 4″ pieces of wood and then a 3″ or 4″ open space down the center of the each side. I don’t know what that design is called. I need instruction on how it is made. Can you help? Hi Laurie, The open space down the enter of the gunwale is exactly that, “An Open Spaced Gunwale”. I have several sources of information that will make this a pleasureable experience. An on-line link for the catspaw is http://www.catspawbuilders.com/. Two books which will help are “Clinker Plywood Boatbuilding Manual” by Iain Oughtred, and “How to Build Glued-Lapstrake Wooden Boats” by John Brooks & Ruth Ann Hill. Another book is specific to the Catspaw, “How to Build the Catspaw Dinghy [Paperback]” which you can find on Amazon.com. Thank you so much. I will look up these resources. 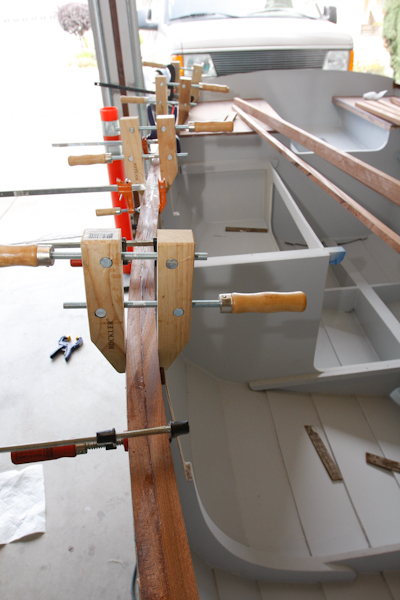 One other question do you varnish all the wooden pieces before you assemble?By the way your boat is beautiful. 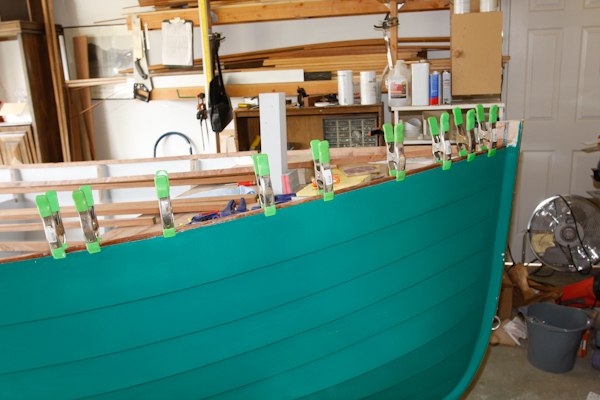 Each boat has different construction requirements and the Ebihen plans call for epoxy seal coating for the majority of parts prior to assembly. 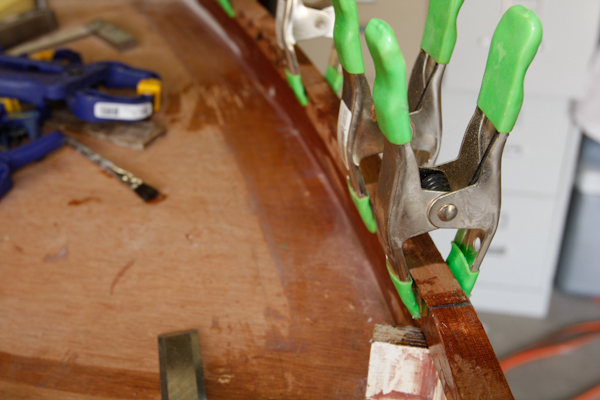 All the edge seams of plywood are epoxy coated for sure. 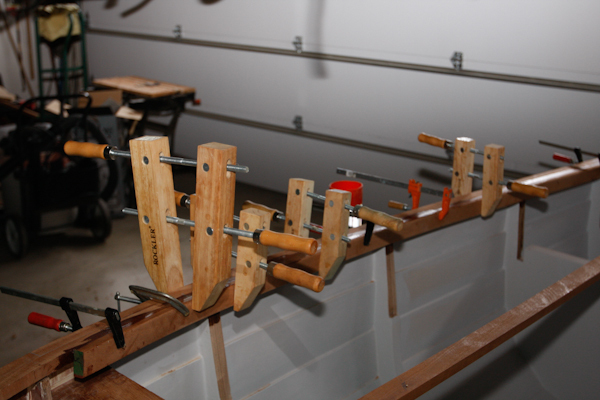 The wood parts that are not to be painted, have been assembled and then varnished. Found your website via Twitter feed, loving the articles, thankyou. Thank you for leaving a reply. I hope my photo’s tell enough of the story to help or entertain.